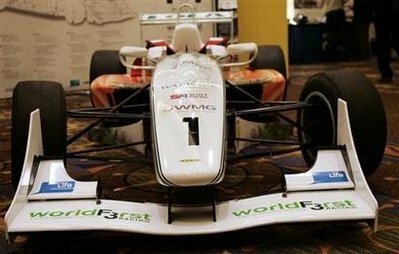 A formula 3 race car that researchers from the University of Warwick in Britain have retrofitted is seen at the MIT Energy Conference 2010 in Boston, Massachusetts March 5, 2010. Fueled by leftover chocolate and with components made from carrots, potato starch and flax, the world& #39;s first sustainable Formula 3 racing car has a top speed of 135 miles per hour and can go from zero to 60 in 2.5 seconds. Sound nuts? Not yet -- brake pads made from cashews are still under development. Meet Lola, the England& #39;s University of Warwick& #39;s blend of muscle and eco-friendliness and the world& #39;s first racing car retrofitted with renewable and sustainable materials. Researchers from the British university showed off their prize possession at the Massachusetts Institute of Technology& #39;s (MIT) energy conference in Boston. "She& #39;s incredibly green, taking materials that would otherwise have ended up in a landfill. It lets people engage with recycling without the finger-wagging," said Kerry Kirwan, one of the car& #39;s designers at the university. "The public has really taken the car to its heart, because she& #39;s fun," he said. Many of the car& #39;s components would more usually be found at a farmer& #39;s market -- or in a trash bin, since most of the materials are actually industrial waste. The 2.0-liter BMW engine has been converted to diesel from gasoline and configured to run on fuel derived from waste from chocolate factories or other plant-based oils. Among Lola& #39;s other unique features is a radiator that converts ozone back to oxygen. "It& #39;s a racing car that cleans up as it goes along," said Steve Maggs, another member of the design team. The World First Formula 3 racing car took the university more than nine months to develop and cost around $200,000. Kirwan said that the thinking behind the project was to find a way to really put recycled materials to the test. "A lot of these technologies were a huge leap of application, something that shows the material under a really demanding application."